Selected as Party of the Day on August 15th! Spin in For Some Fun - Gabriel is Turning One! 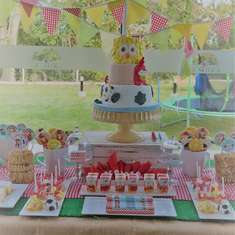 Our guests were invited to spin in for some fun as our little Gabriel turned one. To celebrate my little Gabers TURNING the big ONE we threw him a precious pinwheel themed party. 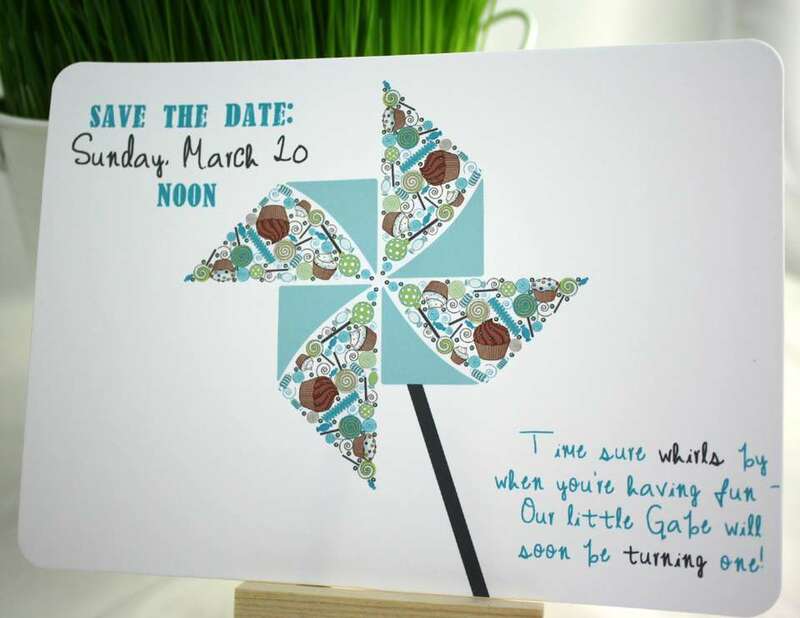 Pinwheel themed Save the Dates, Invites, and Thank You cards were designed to coordinate with the pinwheel theme. Guests were greeted by whirling yardwhirls lining the sidewalk and a pinwheel wreath on the door. Personalized pinwheels included the phrase 'Gabriel is turning one!' on the quadrants. 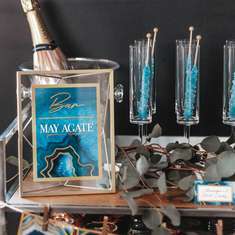 Traditional and double peony pinwheels in the party colors of green, light blue, turquoise, grey, and chocolate brown were scattered around to make our home more festive. Custom pinwheels were also stuck into white tin buckets filled with freshly grown wheat grass. Several memo boards were scattered around the dining area featuring our favorite photos of Gabe throughout his first year. Party pennants were strung to add to the atmosphere. A memo board placed, above his high chair, featured 11 photos of Gabe - each one taken on the third of each month at exactly 12:08 pm (his official birth date). All photos were taken in the same rocker in his nursery and were posed with Mr. Bear. As Gabe grew bigger throughout the year the bear magically grew smaller. Food items included easy to eat items including pinwheel sandwiches and twirly antipasto pasta salad. 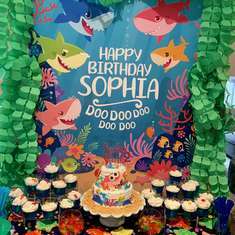 All 20 guests were offered fun party hats from our Pennant and Party Hat Tower. Guests drank their lime-aid (with blueberries for a blue touch) from green and white striped paper straws. The custom flags helped everyone keep track of their drinks throughout the afternoon. Instead of cake, key lime cupcakes with key lime cream cheese icing were served. And yes, all of the personalized pinwheels actually whirled! Instead of cake, key lime cupcakes with key lime cream cheese icing were served. Cupcakes were topped with mini pinwheel cupcake inserts that actually whirled. Estimating less than $400 including food. 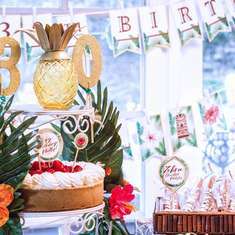 Guests were offered fun party hats from our Pennant and Party Hat Tower and were also free to take home pinwheels as favors. When Gabe got bashful while we sang Happy Birthday - he actually started crying hysterically. Food items included easy to eat items including pinwheel sandwiches and twirly antipasto pasta salad. Guests drank their lime-aid (with blueberries for a blue touch) from green and white striped paper straws. The custom flags helped everyone keep track of their drinks throughout the afternoon. This occurred after the party. While tearing down I realized that my little guy was turning one and realizing that they really do grow too fast! Brought several tears to my eyes. Gabe being a camera ham, just about all day. Nice pics..but block ur address info from the invites..Ur on the internet so anyone can see..